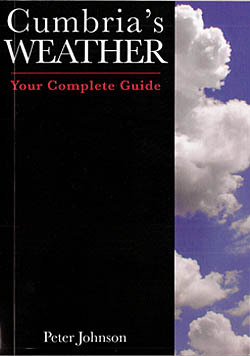 This book is your essential guide to Cumbria's weather: past present and (possibly) the future. Will it rain again tomorrow, or will it be fine? Is that Ireland to be seen from the top on a fine day? Did the snow up there really last all year year round? Could one actually go skiing in July. Surely not six and a half metres of rain in one year? Designed to be used in conjunction with practically any of the many guide books to the county now on offer, it does not claim to have all the answers. However the reader will be more able to appreciate and enjoy Cumbria's ever-changing weather. Peter Johnson is the sort of man who likes to look on the bright side. Cumbria’s dour and dismal weather, days waiting for the clouds to break, for the wind to drop, for the sun to shine, are days of endless fascination. Every cloud seems to hide a silver lining, some nugget of information, some little gem of knowledge that might light up the miserable day. For instance, notoriously wet Borrowdale is not quite the home of the persistent deluge. Peter consolingly informs us that though Seathwaite is the wettest inhabited place in England and can normally expect to have over 200 inches of rain a year, it only has rain falling on two hundred days. So, even though it has five times as much rain as Essex, the driest area of England, Essex still has rain falling on one hundred and fifty days. Cumbrian rain is just heavier and stronger. In fact, it is a source of considerable local pride that there was one month, a long time ago now, the February of 1932, when no rain fell in Seathwaite. Unfortunetely, the sun does not always shine in Cumbria. Parts of the English south coast luxuriate in over two thousand hours of sunshine a year, whereas the Central Fells shiver in a mere thousand hours. However, life is more sybaritic on the Cumbrian coast or in the Eden Valley, where sun-worshippers can celebrate over fifteen hundred hours of sunshine. If you enjoy the wind, Cumbria, it seems, is the place for you. There may be just the merest breeze in the valley, but up on the tops it can be blowing a howling gale. The highest wind speed ever recorded in England was 138 mph at the weather station on Great Dun Fell, near Appleby. Cumbria’s climate benefits from the Gulf Stream. If that genial warm current was turned off, - and some of the gloomier prognosticators and prophets of doom think global warming could make Britain colder - then we would find ourselves with a climate rivalling that of South Georgia or Hudson Bay. As it is, things are colder now than they have been. In Roman times and in the Middle Ages it was possible to grow grapes in the open and buried tree trunks on the slopes of Cross Fell at two thousand feet or more suggest that the climate 6000 years ago was at least two degrees warmer. But Cumbria is not a stranger to frost, cold and snow. St Bega, the legendary founder of St Bees, is reputed to have been promised as much land as was covered in snow on Midsummer’s Day. Lo and behold, the coastal strip was covered in a fall of snow. Cumbria’s Weather is an affectionate portrait of our local climate by a man who has grown to love it over many years. Peter Johnson knows its every mood, its quiet times and blustery moments. He is steeped in the weather lore of the county and he is a keen scientific observer. This is a delightful, idiosyncratic account of our delightfully idiosyncratic weather.